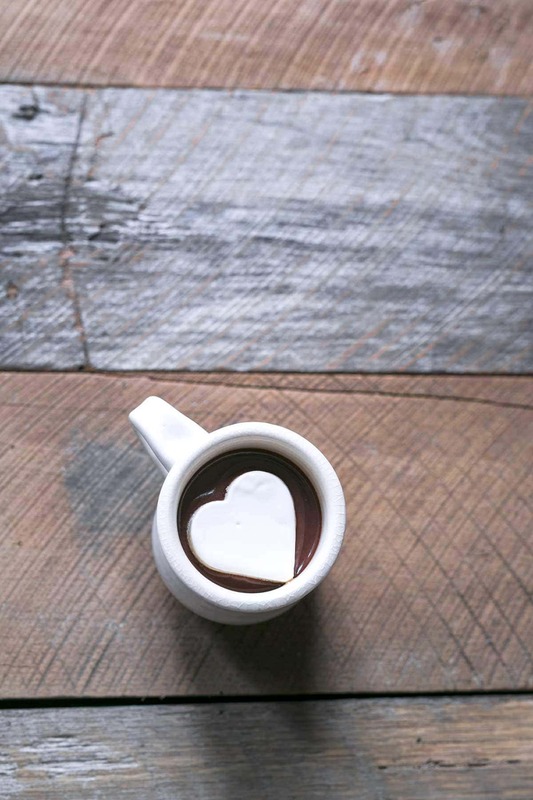 Homemade Hot Chocolate with Whipped Cream Melting Hearts is the ultimate end to a romantic meal. All you need is a heart-shaped cookie cutter & a few ingredients! The hot chocolate recipe is easy to prepare, and can also be enjoyed on its own. 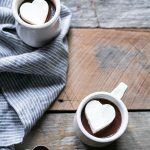 This dessert is perfect for Valentine’s Day or anytime you simply need a mug of comforting hot chocolate. Jeff and I don’t typically do much for Valentine’s Day. Our first date was February 17th, so we’d rather celebrate that. Also, Valentine’s Day happens to be both my mother and brother’s birthday. Not super romantic. However, none of that stops me from preparing sweet treats like homemade hot chocolate. If you’re looking for a simple chocolate recipe that isn’t too heavy, this easy hot chocolate recipe is just the thing. The melting whipped cream hearts look impressive and fancy, but they’re actually quite easy. I promise. If you’re not a fan of Valentine’s Day but like the recipe concept, make melting stars instead. Or melting whatever-cookie-cutters-you-have. If you can whisk cream and sugar together, you can make frozen whipped cream (it’s also great dessert to make with kids, though you’ll need to omit the liqueur, which I’ve included as an optional ingredient). I’ve used a 9×5 inch loaf pan because it’s the perfect size, but you can also use something like a brownie or cake pan. Those are slightly larger, so keep in mind that the hearts will be thinner unless you add more cream. For the best results, the hearts should be approximately the same thickness as the cookie cutters, or around 1 1/2 inches. If the hearts are too thin, they’ll melt very quickly once they touch the hot liquid. So if you use a larger pan, you might want to consider doubling the whipped cream recipe. I added Grand Marnier to the marshmallows, which is completely optional if you don’t want to include alcohol. You can also swap it out for other liqueurs or straight up booze. Some ideas: Chambord, Kahlua, Baileys Irish Cream, Rumchata, bourbon, rum… get the idea? You can also add a splash of whatever you use into the hot chocolate as well. If you love this hot chocolate recipe, you may also enjoy my Chocolate Tart with Toasted Coconut and Sea Salt, Dark Chocolate Cupcakes, and Homemade Brownies! I also love these Chocolate Covered Spiked Cherries from Inspired by Charm. 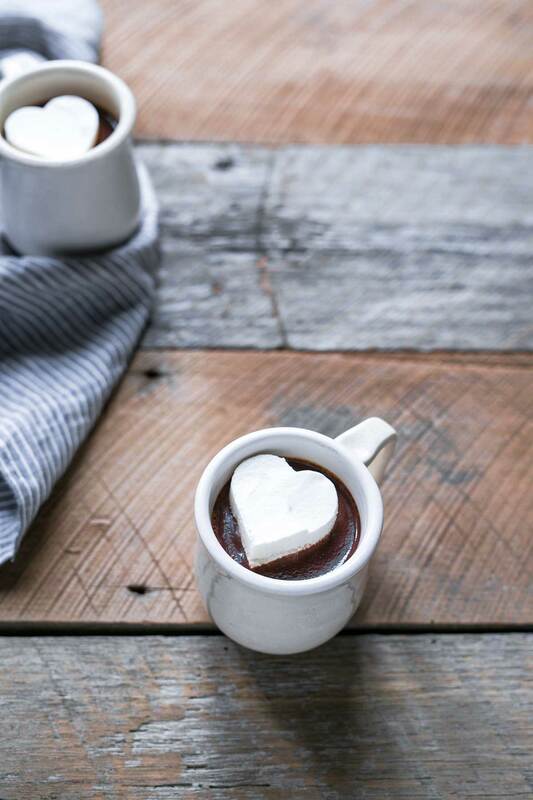 Hot Chocolate with Whipped Cream Melting Hearts is the perfect end to a romantic meal. All you need is a heart-shaped cookie cutter & a few ingredients! Line a 9x5 inch loaf pan with 2 layers of parchment paper, letting each layer hang over 2 sides of the pan (this will make it easy to lift out the frozen whipped cream). In a large bowl, whisk together the cream, sugar, and Grand Marnier (if using), until the cream reaches a soft peak. 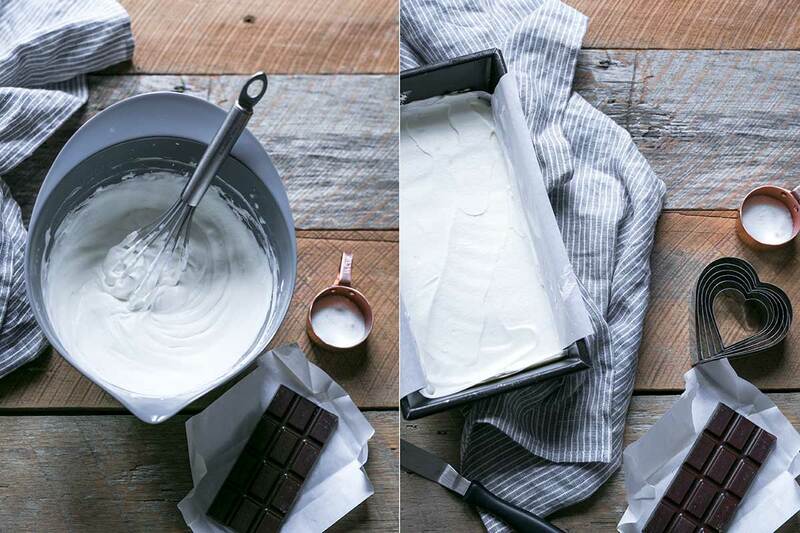 Use a spatula to spread the whipped cream into the loaf pan, taking care to even out the top. If the parchment paper starts to fold over, dab a small amount of whipped cream between the paper and sides of the pan to help hold it in place. Freeze until solid. (Since this will take a few hours, I recommend freezing overnight if you have time. Cover the pan in plastic wrap to prevent odors from seeping in). Once the whipped cream has frozen, remove the loaf pan from the freezer. Use the parchment paper to gently lift the cream onto a cutting board (if there’s resistance, allow it to thaw for 1-2 minutes first). Using a heart-shaped cookie cutter (use one that works with the size of your mugs), press firmly into the cream and lift straight up, then gently tap the cookie cutter onto a clean cutting board to release the heart. Do this several times (the yield will depend on the size of the cookie cutter; you can definitely get 4-6 hearts even with a larger cutter). Place the cutting board with the frozen hearts back in the freezer while preparing the hot chocolate. Place the semi-sweet chocolate in a medium-sized bowl, preferably one with a pouring spout. Set aside. In a small saucepan, heat the milk and vanilla over medium-high heat. Once the milk reaches a simmer, ladle some into the chocolate and stir with a spatula to melt. Continue adding hot milk and stirring until the hot chocolate is smooth. 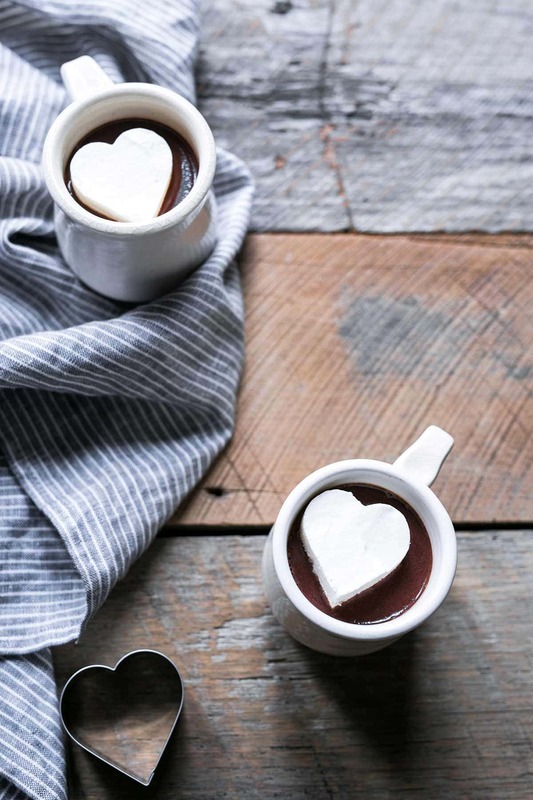 Pour the hot chocolate into 2 mugs and top each with a whipped cream heart. 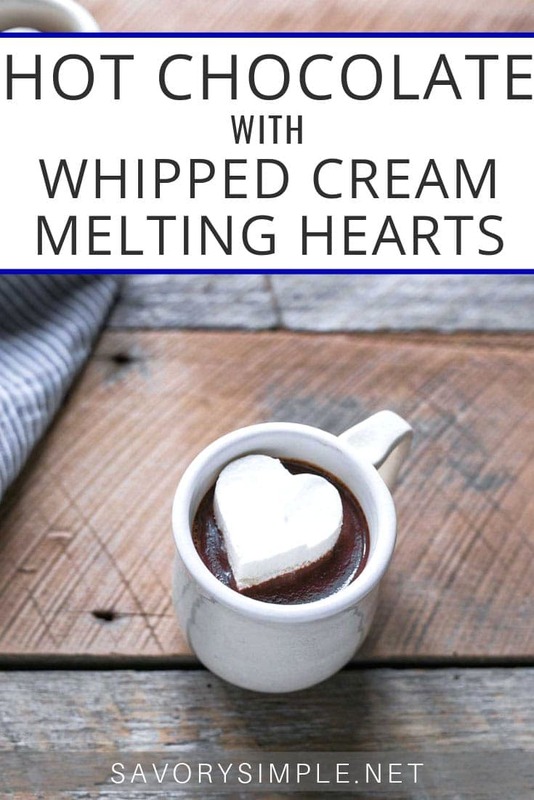 You can use any hot chocolate recipe with the whipped cream hearts. I kept it very simple since those take a bit of effort! Or you can enjoy this hot chocolate on its own, with regular whipped cream, or marshmallows. You can also reduce the calorie content by using lowfat/nonfat milk in the hot chocolate (but that won't be as tasty). This is so cool!!!! I’ve literally never thought of doing this before! LOVE this! What a cool idea for Valentine’s Day or any time we want to let someone know they’re special. This would be a fun project to do with little ones too, using different cutout shapes. Shared on Twitter and on my Facebook foodie page as Recipe of the Day. Thanks! Made these last night. They were great! However (being a Halloween fiend), I did a trial run for next Halloween with the whipped cream. I added a little orange food color and pumpkin spice, cut out pumpkin shapes, and added faces with some chopped chocolate pieces. Went very nicely with the Grand Marnier. We’re going to try them again tonight with snowflake shapes sprinkled with edible glitter, and add creme de menthe. This is a fun and very versatile recipe. Thanks for posting it. Oh my goodness, I keep clinking on link after link and I think I’ve been all over your blog now. :) THESE are so great! I think I’m going to make them even though Valentine’s Day is past because they are just so much fun. These whipped cream shapes are so cute and so versatile! This is just such a fun idea!! Those melting hearts have to be my favorite part! This is such a kid-friendly recipe, they are going to love it! This is so precious! I love this idea and you can cut them into any themed shape. I love this! Looks and sounds so decadent, and the frozen whipped cream hearts are such a fantastic idea! :) Thank you so much for sharing, this is such a great recipe to change up my hot chocolate game! So happy i stumbled upon this blog today. Its cold, we’re snowed in. its the perfect time for hot cocoa. And my kids loved the hearts.